A statue in Florida depicting the iconic image of a sailor kissing a woman in Times Square while celebrating the end of World War II was found vandalized with the "#MeToo" hashtag just days after the sailor died, police said. The "Unconditional Surrender" in Sarasota statue was discovered with the hashtag spray painted in red on the nurse's leg just before 1 a.m. Tuesday, Sarasota Police officials said. A statue in Florida depicting the iconic image of a sailor kissing a woman in Times Square while celebrating the end of World War II was found vandalized with the "#MeToo" hashtag just days after the sailor died, police said. 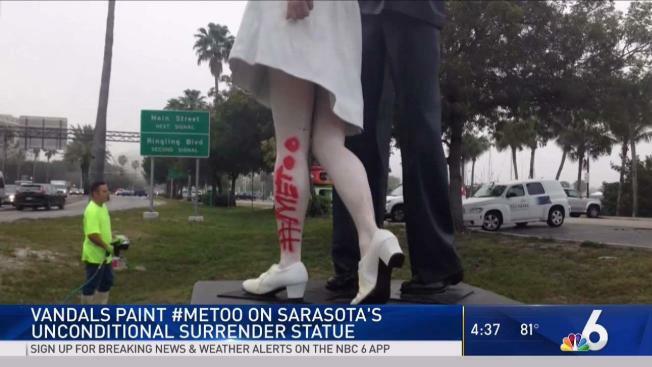 The "Unconditional Surrender" statue in Sarasota was discovered with the hashtag spray-painted in red on the nurse's leg just before 1 a.m. Tuesday, Sarasota police officials said. Police said they canvassed the area but found no other objects spray-painted. There were no surveillance cameras in the area that would have captured the vandalism, police said. The statue depicts the kiss between George Mendonsa and Greta Zimmer Friedman on Aug. 14, 1945 — known as V-J Day, the day Japan surrendered to the United States. Mendonsa planted a kiss on Friedman, whom he had never met, and the photo became one of the most famous of the 20th century. Mendonsa died Sunday at age 95 after he fell and had a seizure at the assisted living facility in Middletown, Rhode Island, where he lived with his wife of 70 years. Friedman died in 2016 at the age of 92 at a hospital in Richmond, Virginia, from complications of old age.